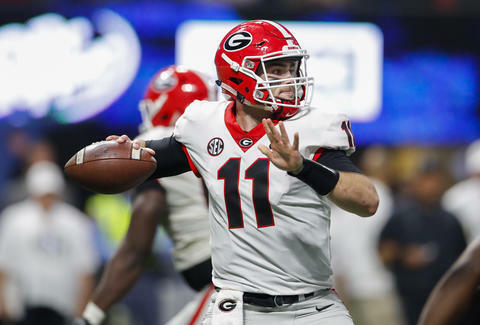 If there's one thing worth dragging yourself out into the cold and snow for on Monday night, it's crowding into the glow of a dozen big screen TVs to watch the Alabama Crimson Tide and the Georgia Bulldogs battle for the NCAA football championship title. OK, three things, if you count ordering pitchers of beer on a weeknight and having a basket of hot wings for dinner. And while almost every bar in NYC will be playing the game, we helped narrow it down to some of the best. You know, because it's too cold out there to mess around. The Bulldogs haven't won a national title since 1980; win or lose, their fans will be bawling their eyes out in the streets tonight. Meanwhile their slightly favored SEC rival, the Tide, haven't won a title since all the way back in, uh, 2015. So win or lose, Alabama fans will be gamely ordering another round and watching Georgia fans bawl their eyes out. Hit a fan-favorite sports bars or just an all-around great spot to drink during the game. 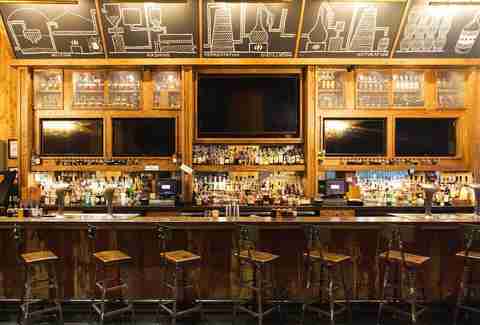 It's your choice from these, the best NYC bars to watch the college football championship. This two-story bar near Penn Station is the epicenter for Georgia fans. In fact, the University of Georgia alumni group is hosting a free watch party for alumni, friends, and fans for the game, starting at 6pm. Get there early, though, as Dawgs fans are expected to fill all 6,500 square feet of this place. Whereas American Whiskey is the epicenter for Georgia fans, The Ainsworth is where you'll find a sea of Alabama fans for the big game. Alabama's local alumni chapter will be there, and per the group's watch party Facebook event, reservations are recommended. The bar boasts 40 HDTVs, seating for at least 200 people, and a killer sound system. While not a sports bar, head to this longtime East Village bar if you're looking for the gritty, no-nonsense NYC bar feel, but still want to watch the game and experience the big sports moment. Like 7B, Whiskey Tavern isn't a sports bar, but it's a helluva place to watch sports. This is largely thanks to the hideaway saloon's dedication to bourbon, rye, and Scotch -- as well as its lineup of bar food, including saucy hot wings. Sports fans flock to this neighborhood bar for games, pool, darts, and its extensive food menu. Here are the drink specials for Monday night, according to Barfly's website: $8 Watermelon Cosmo, $9 Margarita special, $8 Jameson's shots, $11 Jameson's shots (black barrel select reserve), $8 shot & a Narragansett can. During happy hour, score $2 off all drinks (excluding top shelf and discounted specials). 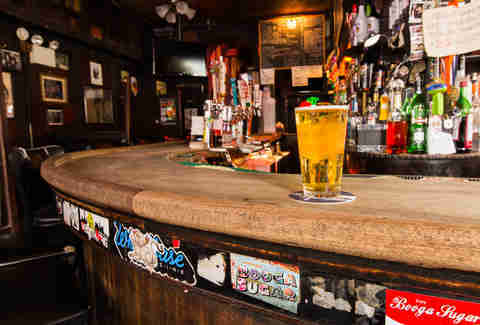 This dive bar is always a reliable -- if not surprisingly manageable -- place to watch a big game on TV and drink from a good selection of draft beers. If you want to watching the championship game at a classic NYC sports bar, then look no further than this UES pub known for its cheap beer and stuffed burgers. In addition to an extensive food menu, the bar boasts 14 fatscreen TVs and three HD projection screens. Monday night's drink specials: $2 mugs, $12 domestic pitchers, and $4 Stella and Sam Light bottles, per The Stumble Inn's website. Sports, beer, hot food -- this Prospect Heights footie bar has all three, and is reliably a place where you'll find full-throated partisans on either side of a big game. Get there before the game to score $4 drafts and $4 well drinks during happy hour from 4pm-7pm. Or you can choose your own adventure with any $3 beer with any well shot for $6 every day. 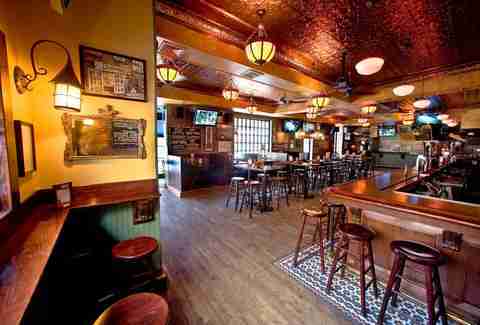 This three-story Irish pub near the heart of Midtown has a lot of space and a lot of booze. 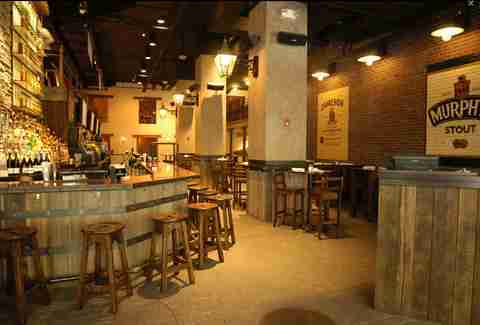 Here, you'll find 25 draft beers, more than 150 bottled beers, and dozens of Irish whiskies. The space also features 36 large HDTVs for watching the game. By the way, you can head here in the event American Whiskey is packed with Georgia fans, as it's only a few blocks away. This South Slope mainstay neighborhood joint is where to go when you want to keep up with the score but prefer chatting with low-key, non-screaming locals while the game plays on one of the bar’s two televisions. Free popcorn, great beer-and-shot specials, a solid rock-‘n’-roll jukebox, and reliably satisfying grilled cheese sandwiches all lend a comforting, homey air to the wood-and-brick environs. Tony Merevick is Senior News Editor at Thrillist and occasionally gets to write about sprots (sports). Send news tips to news@thrillist.com and follow him on Twitter @tonymerevick.